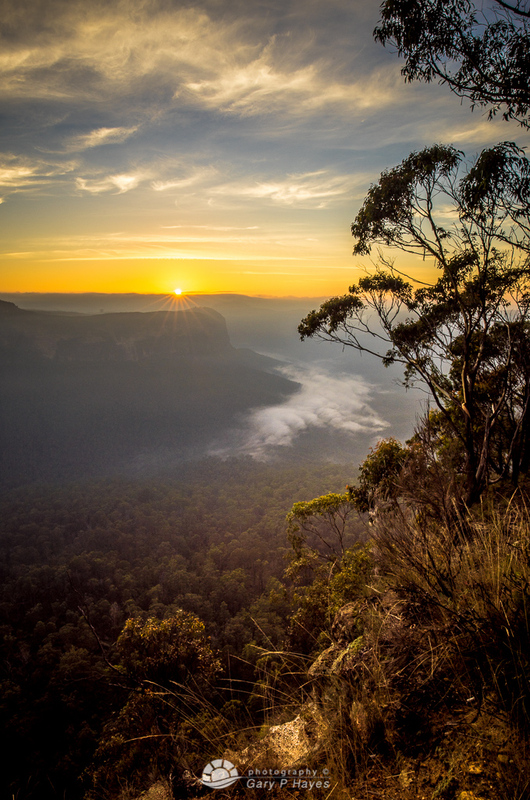 ABOUT: A series of lookouts and walks down into the Grose Valley, Blue Gum forest and campgrounds. But close to the car park there are fantastic views to the right down the Grose towards Evans and Govetts areas (which are just down the right track and past the gully). Fantastic tree canopy for foreground and on misty days the views looking right are stupendous. PHOTO EQUIPMENT TO BRING: Moderate wides 35mm are great for constraining the scenes better and on dynamic light sunsets a tripod is critical. A moderate 85mm telephoto is good for framing some of the distant cliff groupings or some views to the left of the walls of the opposite ridge. GETTING TO THE SPOT/S: Follow the Perry’s Lookdown trail until you reach the end, about 20-25 mins drive. 4WD not totally necessary.